Na 19ª conferência anual da INTERNATIONAL ASSOCIATION FOR DANCE MEDICINE & SCIENCE (IADMS) realizado em Haia - Holanda entre os dias 29 e 31 de Outubro de 2009, apresentámos um tema , em conjunto com o Prof. Luis Xarez da Faculdade de Motricidade Humana, sobre "COOL-DOWN PROGRAM FOR DANCERS"
WHY dancers should do cool-down program? The cool down program is just as important as the warm up to ensure muscle protection from extreme soreness, to help effort recovery, to prevent unforeseen injuries and allows the heart rate to return to normal. The main aim of the cool down program is to promote active recovery and return the body to a pre exercise, or pre work out level. During a strenuous dancing activity body´s dancers go through a number of stressful processes. Neuromuscular system, tendons and joint structures get damaged, and waste products build up within your body. The cool down program, performed properly, will assist your body in its repair and recovery process. One area the cool down will help with is "post exercise muscle soreness." Cool down exercises usually consist of slower dancing, relaxation exercises and active stretches exercises that are designed to lower your heartbeat after dancing and contribute for active recovery after a hard work activity. Making the cool down a permanent part of your regular dance routine is recommended helping a better physically recovery. WHEN should dancers do this program? 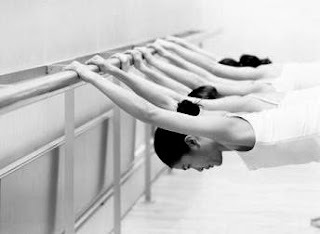 Dancers must develop and perform an appropriate cool down exercises routine after dancing rigorously (class, rehearsal or performance) and before total stop dancing activity. 1) Pick a slower song and dance to it-just be sure you are still moving your body, but going from a fast paced rhythm to a slower paced rhythm. If you just stop cold turkey after dancing, you will put your body at risk. SOME MOVEMENTS BUT SLOWER RHYTM. 2) ACTIVE STRETCHING EXERCICES of the principal muscles that had been working – this program needs to have a common base (depends on type of Dance) and personnel basis (depends of the past or recent history of injuries or complaints). Goal: Release any tension from the joints and muscles. Specificity and duration of exercises depend of type of dance and individual characteristics. 3) Be sure to take the time to slow down your heartbeat the proper way. Have time and prepare your mind to feel your body and the anatomic regions you feel tired or soreness (special trunk, shoulders, and pelvic girdle – axial joints and postural and respiratory muscles) ACTIVE MIND/BODY RELAXATION EXERCICES. 4) Finally you should then spend two to three minutes lying completely flat and feel your body and your breathing. You must do it. Nobody can do it for you. Take an advice and learn with your teacher, other dancers and physical therapists with experience in dance activities BUT DO YOURSELF.